The store got its start back in the 1960's as longtime owner George Garcia transitioned from selling wigs out of his car to owning five large costume stores throughout the city of Chicago. The last remaining (and largest) store was opened in 1969 in the Six Corners area of Chicago. Back in the 60's, this area was a large commercial shopping district on the Northwest side of Chicago. The shop was originally known for its custom wig selection but gradually developed into a sprawling 20,000 square foot store carrying everything a costume lover could desire, all year round. The store's mission hasn’t changed over the last five decades: help customers look great while having fun. And it's OK to get a little crazy. Fantasy Costumes is the authority on all things dress-up. Though we're proud of being the best and largest Halloween store in Chicago, we serve a variety of different communities including television and film crews shooting in the Chicago area, Cosplayers and Fans attending the Chicago Comic & Entertainment Expo (C2E2), Wizard World, and businesses throwing themed events. We can customize orders to fit your needs. And we specialize in rare & hard-to-find items. We can't show all the items we carry here, so if you don't see what you want, call us toll-free @ 1-800-872-9447 and we'll find it for you. We're so glad you have stopped by our website and we trust you'll find what you're looking for at a great price. 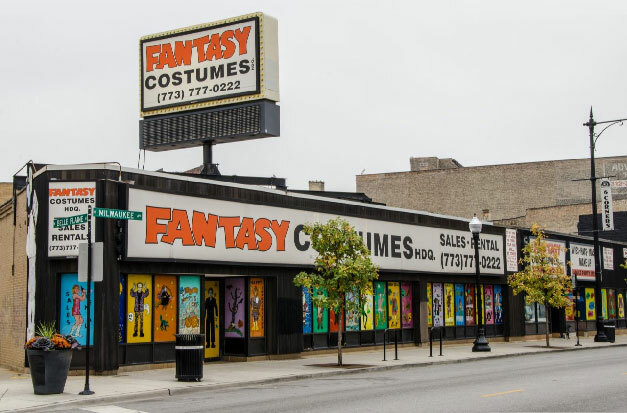 Don't hesitate to contact us with any questions, and if you happen to be in the Chicago area stop by our costume superstore and say hi! We're at 4065 N Milwaukee Ave in Chicago, Illinois!